The wood grain & color choices from Sunrise provide many style options. Having replacement windows installed is a major investment. With so many window manufacturers and even more contractors out there, it can be confusing to find the right brand of window and the right installer. But it doesn’t have to be. When you have Sunrise Replacement Windows installed by Dr. Energy Saver, you’re going with a combination that can’t be beat in terms of energy efficiency, style, convenience, craftsmanship and overall value. Find your local Dr. Energy Saver dealer today and ask about Sunrise Windows! We have companies all across the nation ready to assist with your window replacement needs. Based in Temperance, MI, Sunrise Windows is not as well-known as big-name manufacturers like Pella and Andersen. But since the company was founded in 1994, Sunrise has earned numerous industry awards for innovation. With reasonable prices and products that outperform big-name brands, Sunrise Windows offer exceptional value to homeowners who want to get the most for their money. Rated for superior comfort and energy performance. All windows are rated by the National Fenestration Registration Council for energy performance. Sunrise Windows outperform Pella and Andersen windows in critical draft control and thermal performance categories. Innovative, industry-leading features provide exceptional value. Sunrise Windows incorporate cutting-edge technology to improve key performance factors like strength, durability, insulation value and security. Sunrise Windows have low-profile, welded vinyl frames that are strong, attractive and insulated with high R-value polyurethane foam. Advanced edge seal technology provides extra strength while also preventing seal failure and internal condensation problems. A smaller frame means a bigger view. Many lower-quality replacement windows are made with wider, thicker frames that reduce the window’s glazed (glass) area. As a result, your view outside is diminished, along with the amount of natural light that comes through the window. Sunrise Windows utilize strong, low-profile vinyl frames that maximize your viewing area. Get exactly the look you like. Some replacement windows only come in white. 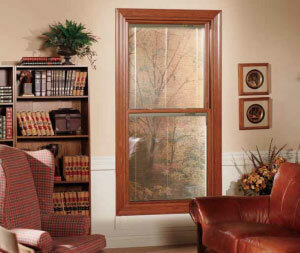 With Sunrise Windows, you can choose from an exciting variety of wood grain and color finishes. It’s even possible to have a wood grain finish on interior surfaces and a color on exterior surfaces of the same window unit. The best warranty in the business, by a long margin. Big name window manufacturers offer very similar warranties on hardware, glass seals and screens. But they can’t compete with the warranty available from Sunrise Windows. Wouldn’t you rather have a lifetime warranty? The certified dealers that make up the Dr. Energy Saver network are trained to install these beneficial windows. Contact your local dealer today to see if Sunrise Windows are available for your home!